Washington and syrah have a special relationship. The state's more established vineyards and winemakers have a demonstrated ability to produce examples of the wine that are always of high quality and character and, on occasion, border on beautiful and profound. For me, syrah, like pinot noir, has an ability to express the character of the place it's grown in a way that surpasses most wines. And the great variety of vineyard sites and growing conditions in Washington gives you the opportunity to sample wines that range from elegant to masculine, from subtle to broad shouldered. One of the standard-bearers of excellence for Washington syrah comes from Waters Winery and their Forgotten Hills Syrah, a bottling that is reliably polarizing, gamy, funky and full of smoke. The Forgotten Hills vineyard is on the "climatic edge," at about 1,000 feet of elevation in the foothills of the Blue Mountains. That climatic edge is double-edged; in a warmer year the cool site produces the Forgotten Hills wine with both ripeness and substantial acidity - a gamble that pays off in spades. In cooler years, however, walking that edge can prove dangerous and if ripeness is not realized, there is simply no way to pull off a Forgotten Hills single vineyard bottling. As syrah bottlings go in Washington, single vineyard or otherwise, Forgotten Hills is among the best. It's got a great reputation and impressive scores from the major wine magazines. In any given year, it's the goal of winemaker Jamie Brown to make a Forgotten Hills Syrah, but when the weather doesn't get warm enough to fully ripen the fruit, he won't make a wine that doesn't live up to the reputation that has been established. The last vintage of Forgotten Hills was 2009, a warmer year; 2010 and 2011 were both too cold to produce the ripeness required. The wine is spectacular. I'm absolutely in love with it, and what makes it such a standout for me is that it is so stunningly different. You get a nod to those gamy, earthen aromatics that are classically Forgotten Hills but there's lots of floral elegance at play as well. The wine has an acidity that pulses with energy. The syrah bears some resemblance to the Arnot Roberts and Wind Gap wines from the Sonoma Coast, where they're intentionally pushing the boundaries in terms of what "ripe" means. The Tremolo has alcohol levels in the 12% range and a vibrancy and freshness from higher acids. More medium bodied than most of the fuller, rounder, riper syrahs that Washington traditionally makes, the Tremolo is a beautiful illustration in extraordinary vintage variation. "It's a fine line, we have cooler sites on purpose and we suffer with them often times." But the wine can be incredibly instructive for Washington wine consumers. "It's healthy for your area or micro-climate to have a broad range. Are people willing to do that?" Jamie is, and what he's found is a reception that is both open and curious. Certainly the reputation of Waters and Jamie as a winemaker has allowed them to show people just how important a role climate and vintage play. "This wine can teach consumers about things like vintage variation, I won't ever make a bad wine, technically, if they trust my skillset they might be more willing to open up to a wine like this." There are commodity wines and there are art wines, and this is certainly the latter. It's a more artistic expression than you'll typically find in Washington, but it's refreshing, both literally and metaphorically. For Jamie as a winemaker, it's been an exciting opportunity. It's a style of wine he's always hoped to be able to make, and it came about organically, by letting nature take its course; without forcing it by picking early to get higher acids and lower alcohol. Jamie would love another crack at a wine like this but he said "honestly, it may never happen again. It was just the vintage and the site lined up perfectly." Here's to hoping. 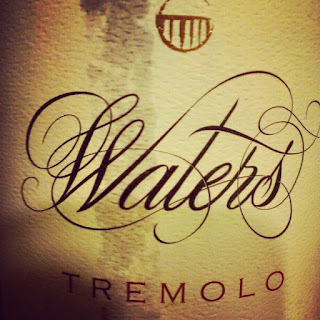 2010 Waters Winery Tremolo-(I drank this wine on January 1st of this year or it would have easily been my wine of the year from Washington for 2012.) I cannot say enough good things about this wine, but I'll begin by saying I wish Washington could make more wines like it. Aromatics that are lively as opposed to dense, dried violets, crushed stone and faint hints of gunpowder. The palate has sage, black plums and montmorency cherries with touches of smoke. The acid and low alcohol hint at French origins and the wine couldn't be better suited for food. There is a note on the back label that recommends drinking now. I however bought a gaggle of this wine and my experience has been that acid helps a wine age very well so I'll be holding onto some of it to see how it changes. $40 (a bargain) this wine was provided as a sample.